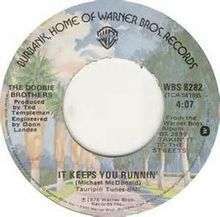 (1976) "It Keeps You Runnin'"
(1976) "Little Darling (I Need You)"
"It Keeps You Runnin'" is a song by the American rock band The Doobie Brothers. The song was written by band member Michael McDonald, and served as the third single from their sixth studio album "Takin' It to the Streets." The Doobie Brothers version was featured in the 1994 Oscar-winning film "Forrest Gump", and was included on the film's multi-platinum selling soundtrack album. The song was also featured in the soundtrack of the movie "FM" (1978). 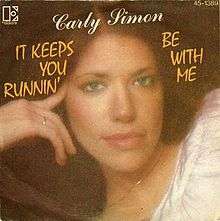 (1975) "It Keeps You Runnin'"
(1976) "Nobody Does It Better"
American singer-songwriter and musician Carly Simon covered "It Keeps You Runnin'" for her sixth studio album Another Passenger, and the song served as the lead single. Simon's version charted on both the Billboard Pop singles chart and the Billboard Adult Contemporary chart. The Doobie Brothers provided backing vocals on the track. Ted Templeman produced both Simon's and The Doobie's versions, as well as each of their albums from which the song is featured. ↑ "Forrest Gump [Original Soundtrack]". Allmusic. Retrieved 2014-12-17. ↑ "The Doobie Brothers - Chart history | Billboard". Billboard.com. Retrieved 2014-12-18. ↑ Mike Ragogna (30 August 2010). "Dukes of September, McCartney's Guitarist & An Australian's Tourabout: Conversations With Michael McDonald, Brian Ray, and Xavier Rudd". Huffington Post. Retrieved 20 February 2016. ↑ "Carly Simon - Chart history | Billboard (Hot 100)". Billboard.com. Retrieved 2014-12-18. ↑ "Carly Simon - Chart history | Billboard (AC)". Billboard.com. Retrieved 2014-12-18.